Here are some more photos from the grandparents' visit last week. We spent one evening at Concord Park grilling burgers, fishing, and roasting S'Mores. Laura caught two fish with help...she didn't want to touch them, though. We love The Little Gym! This has been the best summer activity. Both sets of grandparents got to watch our little gymnast. One day we visited the Smokies National Park to enjoy a picnic. 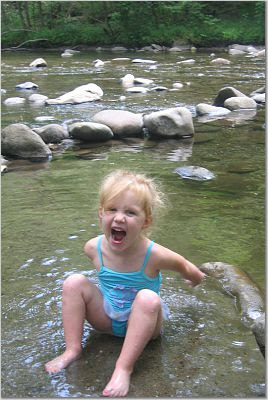 Laura loved the cold river stream. The highlight was getting a heart-shaped rock that Jim found for her. 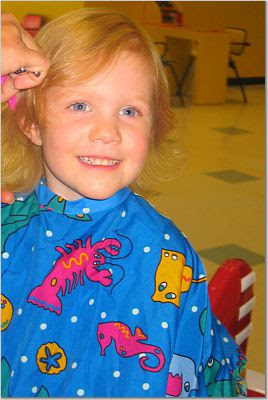 Finally, a first official haircut. It has taken 3 years for Laura to get enough hair to cut! Fun times for you guys!!! Oh, she is just having so much fun!! 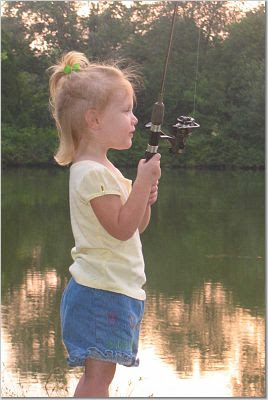 I love the fishing picture...she is just getting so very big to be able to do all these things! She looks just like Jim! I know you must hear this all the time and it's not fair (mine looks like my husband, too), but WOW! She's a cutie pie! Hope things are going well for you guys! Her expression in the water photo is priceless. Love it.